Cue 'The End' by the Doors. We're flying low over the Burning Trees. Burning wood. Campfires. BBQ. When's breakfast? Steve, a photographer from the midwest and I are in a helicopter piloted by Sean and directed by Hilo lava master Bruce Omori. Steve, unfortunately, is motion sick and, no doubt, is not thinking much beyond, “where’s the scopolamine patch?”. 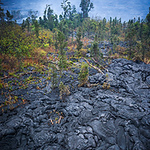 We’ve dropped into the Pu’u O’o crater to check out the lava lake. I’m just getting a clue as to what I want to shoot and I’m wishing I had a longer lens. Now we’re over the pali. The extent of the lava flow and the otherworldly weird contortions that look like H.R Giger’s alien canvases are hard to stop staring at. Since we’re a photography charter, we’re allowed to be lower than the 1500’ that’s the minimum altitude required of sightseeing flights. At times, Sean has to move the heli away from the flow to let it cool down. 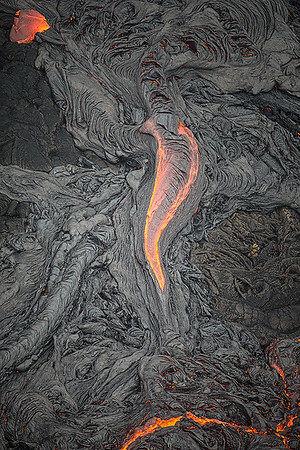 We see ohi’a trees burst into flame as the lava consumes them. The embers fly up and surround us like fireflies. 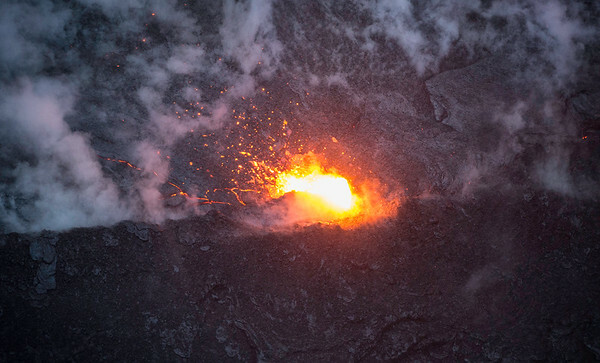 Fiery pachinko balls of lava tumble down the pali. Too soon, it’s time to turn around and get some breakfast.